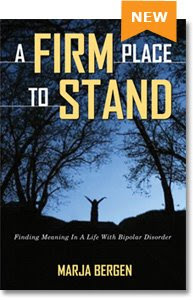 A Firm Place to Stand is a must-read for Christians who struggle with mental health challenges and the faith communities who minister to them. In her sincere and candid style, Marja Bergen reflects on her forty-two years with bipolar disorder, showing how faith in God can help a person with a serious illness turn weakness into strength. She describes how God transformed her from an insecure, withdrawn person into a leader, an activist, and the founder of Living Room, the growing Christian support group for people with mood disorders.